Tomorrow, November 27, consultant recommendations from the Jackson County Commuter Corridors Alternatives Analysis will be presented to stakeholders in the morning, and to the public that afternoon. Transit consultant Parsons Brinckerhoff (PB), guided by Mid-America Regional Council, Jackson County, Kansas City, and Kansas City Area Transportation Authority, has been studying commuter needs in three corridors for nearly three years. Work on the I-70 and Rock Island corridors is about complete, while work on the third corridor, US-71, got started late and is farther behind. – Commuter rail is in. Commuter rail will be recommended in the I-70 corridor since the underlying motivation for the AA was to find a way to make commuter rail workable. – Union Station is out. Union Station is out and Third and Grand is back in as the western terminus for commuter rail from eastern Jackson County. This is the site of the current KCATA park-and-ride lot and the end of the MAX and future Downtown Streetcar lines. Jackson County tried to work with Kansas City Terminal Railway to get access to Union Station, but latest indications are that KCT has not been interested in a capacity analysis on their tracks to see if it could be made to work — not even if Jackson County pays for the study. Union Station has been the preferred terminus from the beginning, so we expect to hear that some day commuter rail might go there. Realistically, that isn’t likely if hundreds of millions of dollars are spent going to Third and Grand. – No CEI. We had anticipated that the study would include a Cost-Effectiveness Index (CEI) for each rail corridor. However, indications are that it won’t. The CEI is a standard measure of costs and benefits (and thus of relative merit) used by the Federal Transit Administration in evaluating projects that compete for federal funding. Omission of this measure is disappointing in light of the emphasis PB’s Shawn Dikes put on it at the first stakeholder meeting. A rule of thumb in transit studies is that following FTA procedures is a good indication of whether a project makes sense – whether FTA funding is to be sought or not. We suspect the Study Team knows without doing the calculations that commuter rail in this corridor isn’t cost-effective by FTA standards, and just doesn’t want to release unfavorable information – even though more than $1.2 million has been spent on the study. Our preference is to have the CEI as an objective comparison to recent commuter rail projects in other cities, and to thus have a better-informed electorate. 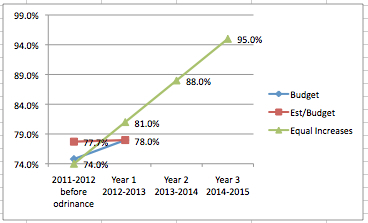 Thus, we’re disappointed that PB hasn’t stayed true to its original focus on the importance of the CEI number. – There is political and popular support for transit. Unlike in 2007, there is political will to take a transit and trails package to the voters, even if we have to pay locally for most of any rail proposal. The AA might not support federal funding for rail, but people do a lot of things subjectively, and there’s a widely held perception that the Kansas City Region should have rail. Commuter rail might still be five years or more away – detailed environmental studies related to impacts on Kessler Park plus construction will take time. One line for commuter rail. A hefty trails plan that includes the old Rock Island right-of-way as a connection to the cross-state Katy Trail. Upgraded express bus service with more frequent peak hour trips, plus at least a few midday trips. New transit routes to connect the various cities, especially in Eastern Jackson County. Something significant for Kansas City. The city already pays for the region’s highest level of transit service, including two popular BRT routes, a Downtown Streetcar line expected to begin construction in 2013, and more than a dozen routes that operate 7 days a week. Jackson County has been talking about BRT on Prospect, and we’re interested to see what else the County has planned to entice KCMO residents. Tuesday is the day to watch. The Stakeholder Advisory Panel will meet at MARC at 8:00 am to hear and respond to the recommendations for the corridors, followed by the Open House for the public at 140 Walnut in River Market between 4:00 and 6:00 pm. So there you have it – what we think we know. We’re willing to be proven wrong, of course. But we can promise you one thing: It’s going to be One Interesting Tuesday. 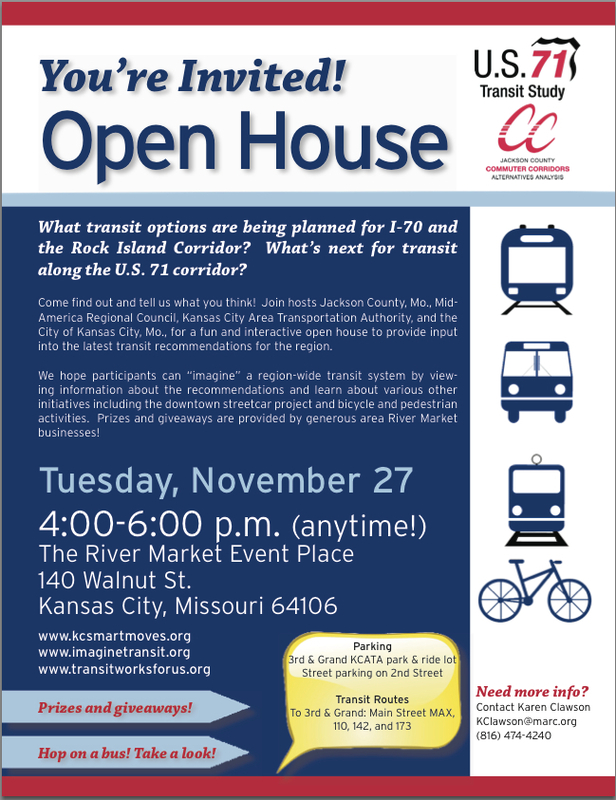 Join us at the last open house for the Jackson County Commuter Corridors Alternatives Analysis, which covers the I-70 and Rock Island Corridors. The last Stakeholder Advisory Panel meeting is being held the morning of Nov. 27 and this public gathering is on the same evening. Learn about the final recommendations being made toward determining an LPA, “Locally Preferred Alternative” and provide your input for the Partnership Team. This open house provides information on all three corridors being studied; I-70, Rock Island and US 71. 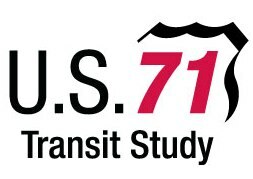 The US 71 Transit Study is ongoing. There will be prizes and giveaways, too! TAN advocates Janet Rogers and Mark McDowell have enjoyed serving on the JCCC AA Stakeholder Advisory Panel and they continue to serve on the Stakeholder Advisory Panel for the US 71 Transit Study. County Executive Mike Sanders left it until the end in his annual State of the County Address last Friday, but he left no doubt that he’s still committed to public transit. Speaking to a standing room only crowd in the Greater Kansas City Chamber of Commerce Board Room at Union Station, Sanders spoke with pride of guiding principles for his administration, one of which is that we don’t borrow from the promise of the future to meet the needs of today. 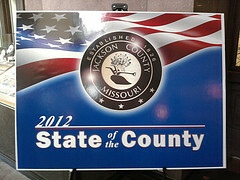 Jackson County balanced the budget without raising taxes, he said, and is one of only six Missouri counties with a Double-A bond rating. In introducing Sanders, Kansas City Mayor Sly James spoke optimistically of the election currently underway to fund a Downtown Streetcar. Construction begins next year, James said, with fare-free operation beginning in 2015. Though he didn’t say so explicitly, the Streetcar project might not be underway at all were it not for Sanders’ leadership on regional transit. An introductory video emphasized the close working relationships between Jackson County and the mayors of the county’s principal municipalities. Transit, specifically plans for a comprehensive regional transit system, was cited as one of the areas of common agreement. Sanders invoked inspiring imagery a number of times during his speech. We face new and serious challenges, he said, but America was built on courage and imagination, not fear. Sanders spoke of expansion of the existing County trail system, and said extension of that system into Kansas City would begin next year with strong support from Kansas City Councilwoman Cindy Circo. Finally he got to transit. We meet in an iconic structure, he said, one that illustrates the power of transportation to connect us. No initiative has the potential to shape our future more than to build a modern, efficient public transit system. Sanders compared building a comprehensive transit system in Jackson County to the Interstate Highway System that President Dwight D. Eisenhower launched in 1955. Such a system is needed to meet Jackson County’s transportation needs, he said, and it must be our next great enterprise to build a system of rail, buses, and trails so future generations will have greater choice in how they get around. Young people want and demand rail and other public transit options. Sanders also cited a recent Brookings Institution report that ranked Kansas City 94th out of 100 urban areas in its ability to provide its citizens access to jobs and other opportunities by transit. The process of constructing a World Class public transit system is complicated, Sanders said — an obvious reference to current discussions with the freight railroads over use of their tracks for getting commuter trains to Union Station. We need to invest the time it takes to plan a great system, he said. It’s not about getting transit done fast, it’s about getting it done right. Through an unprecedented collaboration, Jackson County Mayors are in agreement, and are speaking with one voice. A solution on transit is within reach, and it’s clear that Mike Sanders’ commitment is still there. On reflection, it seems notable that Sanders did not make any specific reference to commuter rail. Nor did he mention a possible target date for submitting a Trails and Transit funding measure to the voters, perhaps because there are a lot of details yet to be worked out. (See our blog post, Jackson County Transit Studies Update – Our Current Assessment) Speaking with reporters afterward, he mentioned August or November next year as possible dates. That’s consistent with information we’ve had for several months.